With the arrival of Federation’s new fiscal year, our organization embarks on another change in its journey to connect donors to their specific passions while maintaining our mission to ensure the future of our Jewish community and care for those in need, wherever they may be. Our CEO of 6 years, Michael Sonduck, also turns a new page on his distinguished career, entering a long-planned and much-deserved “retirement” (people like Michael do not fully retire). In my ruminations on his tenure at Federation, I explored my perspective on his legacy. My conclusion: It is one that has forever changed the course of Federation and set it on a course that will better serve the community. In the last six weeks or so, I have publicly expressed my personal and organizational appreciation for Michael’s leadership. His wise and articulate interactions with donors, peers, and detractors have already had an enormous impact during the early stages of this difficult paradigmatic shift. These successes could prove to be a significant component of his legacy. From my perspective, though, I characterize his legacy for our community in one word: Courage. The Federation system is under severe attack, not from others, but from the diminishing relevance of its traditional model. Few organizations even survive the hundred and some years that many Federations have served throughout the US. Those that have managed to exist that long are usually so invested, financially and psychologically, in their modus operandi, that change is an insurmountable challenge. To create paradigmatic change, one needs vision, perseverance, humility, and most of all, courage. Michael has exhibited all of those traits, and courage has been the one that sets our Federation apart from every other in the country. So far, and we are far from finished, this endeavor has been challenging, but real change always is. Michael’s courage in leading a dramatically new vision on how Federation should function in the community cannot be overstated. While he has had staff and lay support throughout, it is Michael who was on the front lines, working tirelessly and, often, thanklessly to ensure that Federation remained committed to combatting growing irrelevance. To remain steadfast in his dedication to the new direction while absorbing vocal and whispered criticism (which he internalizes and considers in order to improve our model) took more courage than people comprehend. Now, Michael begins his new personal journey. I thank him for his legacy of courage in leading our community into unchartered and stormy waters. It is a journey we must take, and we all expect course corrections along the way, but it was Michael who got us started – who had the courage and love for his Jewish heritage, the San Diego Jewish community, and the ultimate mission of Federation. G-dspeed, my friend, and thank you for what will be an enduring legacy. May Federation fulfill its potential and you yours. 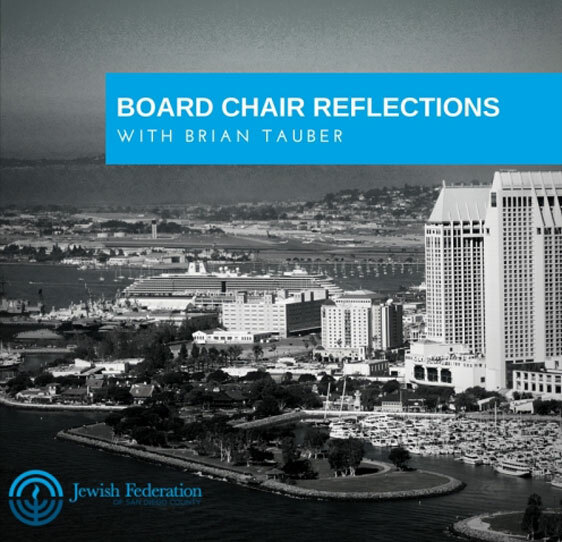 Where can I find the Mission Statement of Jewish Federation of San Diego County. ?